The United States Postal Service will not accept rectangular packages if the perimeter of one end of the package plus the length of the package is greater than 130 in. 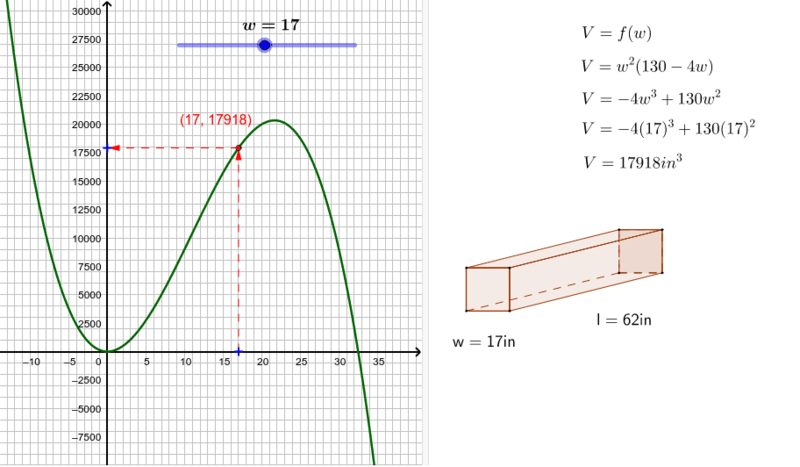 Model with mathematics: Write the volume of the package as a function of w, the width of the square end of the package. DO NOW 1. Explain why the function V(w) that you used in this lesson is a third-degree equation. 2. Explain why the value of w cannot equal 0 in this situation. 3. Explain why the value of w must be strictly less than 32.5 in this situation. 4. In this situation, is it possible for the range of the function to be all real numbers? Why or why not? 5. Critique the reasoning of others. Another method of shipping at the Post Office allows for the perimeter of one end of a box plus the length of that box to be no greater than 165 inches. Sarena wants to ship a box whose height is twice the width using this method. She says the formula for the volume of such a box is V(w) = (165 − 6w)2w2. Her sister, Monique, says the formula is V(w) = (165 − w)w2. Who is right? Justify your response.